The What: Matrox Graphics Inc. and 3M Touch Systems (subsidiary of the 3M Electronic Solutions Division) said both companies have validated a new 3M touch driver that will support multi-touch functionality across two, three or more 3M Multi-touch Displays powered by a variety of Matrox multi-monitor products. Integrators can now pair Matrox products with 3M Multi-touch Displays to create interactive digital signage and collaborative video walls that span multiple displays, without the need for touch overlays or licensing fees. The What Else: Applications include interactive kiosks, way finding, retail and exhibit display walls, as well as collaborative multi-panel classroom, boardroom, and command & control installations. The 3M MT7.14.0 driver for 32-bit and 64-bit versions of Microsoft® Windows 7 is available now as a free download driver from the 3M website. 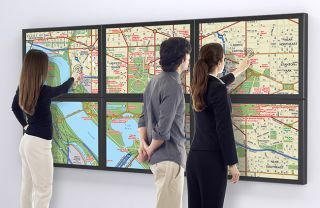 Why This Matters: “With our Mura MPX, DualHead2Go and TripleHead2Go products, multiple displays are seen as one large stretched desktop, and standard off-the-shelf touch displays typically have had difficulty supporting this stretched-desktop mode,” said Caroline Injoyan, Business Development Manager, Matrox Graphics Inc.